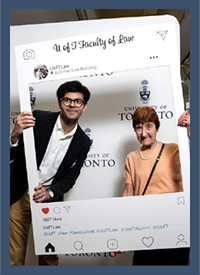 The University of Toronto Faculty of Law has announced a $30 million campaign to significantly deepen the financial aid pool and enhance the student experience. 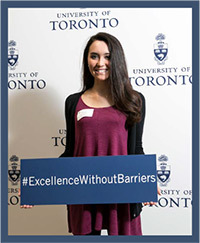 The Campaign for Excellence without Barriers, with a specific goal of raising $20 million for student financial aid, is the largest bursary-focused campaign at any Canadian law school. Increasing accessibility to the Faculty of Law for students who merit admission is the number one priority for the law school. The Faculty of Law awards bursaries only on the basis of financial need, to those students who need it most. Increasing the financial aid pool helps support applications by top candidates with financial need, alleviates stress for students during law school, and helps graduates make career decisions based on their choice and passion—often in social justice and public service areas, benefitting our communities. And the Faculty assists wiht eligible academic debt repayment with its unique Post-Graduate Debt Relief Program. To date, U of T Law alumni and other supporters have given more than $25 million to the Campaign for students, including $15 million for student financial aid—and the support keeps growing. Other gifts support co-curricular programming for students, such as legal clinics, mental health initiatives, professional skills development and other opportunities while in law school. A number of factors, including declining government support for post-secondary institutions, have created a sobering reality for many Canadian law schools. The Faculty of Law’s tuition fees, $36,720 for 2018-19, make possible a world-class academic experience and robust co-curricular programming, such as clinical and internship opportunities, combined degree programs, career services, to name a few, in addition to one of the best legal educations in the world. The campaign is expected to wrap up by December 2019. “The momentum for the Campaign for Excellence without Barriers has been tremendous. Through their generosity, our alumni have dramatically opened up opportunities for many brilliant and talented law students, and we are truly grateful,” says Dean Iacobucci.